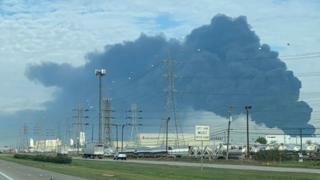 Residents of a city in south-east Texas have been warned to stay indoors after a fire at a chemical plant led to an escape of the chemical benzene. The City of Deer Park, near Houston, advised people to close windows and take other measures to prevent chemical vapour entering their homes. The plant owner said levels of benzene in the atmosphere were "below those that represent an immediate risk". The warning has been issued to all of Deer Park's 32,000 residents. Schools in and near the city have been closed. A number of tanks containing the chemicals naptha and xylene, which are used in gasoline and solvents, caught fire on Sunday. The blaze was finally extinguished on Wednesday. Texas' environmental regulator has launched an investigation. No injuries have been reported and the cause is not yet known. 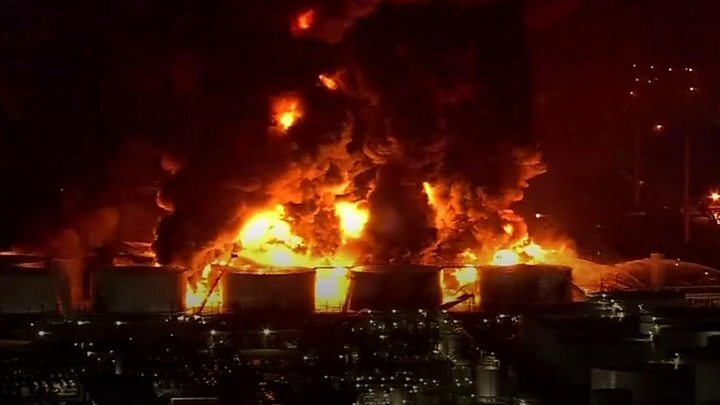 Plant owner Intercontinental Terminals Company said in a statement: "The fire remains extinguished, however onsite responders are reporting increased levels of benzene. "These levels are below those that represent an immediate risk."